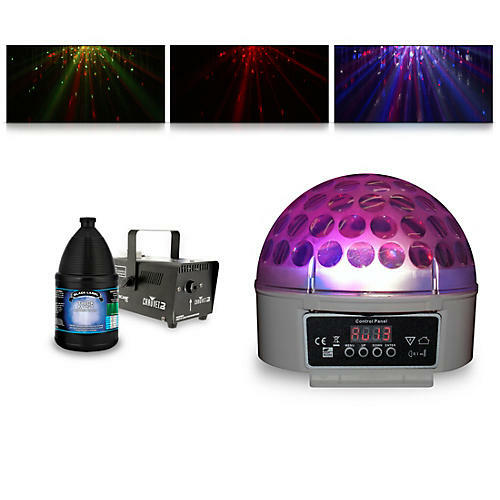 This convenient lighting package makes it easy to bring your next party or event to life, so you spend more time entertaining and less time researching what gear to buy. We’ve done all the work for you and hand-selected the components for optimum performance and value. You can count on high-tech features and reliable components to make your event more dynamic and impactful. The Chauvet Hurricane 700 Fog Machine gets the fog bank rolling with a 450W heater that puts out 1,500 cubic feet of fog per minute. The Hurricane 700 has a tank capacity of .8L, and comes with a free pint of fog juice. This Chauvet fogger also has a manual fog button, and is packaged with a wired remote (FC-1). In only 4 minutes the Hurricane 700 fogger is heated up enough to provide a great atmospheric effect at your event. When the situation calls for a simple, yet highly effective lighting solution, look no further than Blizzard’s Snowball to get the party started. With built-in automated programs and DMX operation, this compact, user-friendly fixture is ready to rock right out of the box in sound active mode. The 4-button LED control panel makes programming a breeze, giving you access to all the Snowball’s operating parameters. At the heart of the Blizzard Snowball are four super-bright 3W RGBW LEDs that send dazzling rays of light out across the dance floor in a 360° horizontal coverage pattern. In essence this compact powerhouse takes the classic mirror ball look and improves upon it tenfold, with a seemingly endless variety of effects and colors. In addition to DMX operation the Snowball features full RGBW dimming, variable electronic strobe, 19 automatic programs and speed control. You can count on hours of reliable performance, night after night, thanks to its built-in cooling fan.